Your solution to all of your residential drywall needs! Richter Drywall provides quality drywall for residential remodeling and repair. Visit our textures and corners gallery to see what services we can provide for you. We offer different corner types such as round of all sizes and square. 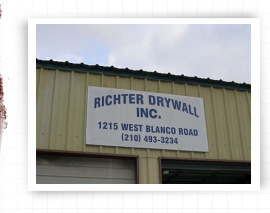 Richter Drywall is your solution to all of your residential drywall needs. We stand by our finished product and offer full-service warranty to your homeowners. It is our goal to produce a quality product in a timely manner. Please leave us feedback and read referrals from satisfied customers just like you. Richter Drywall is focused on providing a turnkey product, with quality and customer service being our company's mainstay. We have in force 20 hanging crews, 18 finishing crews, and 20 repairmen to handle all aspects of our scope of work. Let us provide an estimate for your needs by clicking here and requesting a quote.